Congenital lobar emphysema has been recognized with increased frequency in recent years as one of the causes of respiratory distress during infancy. It is characterized by overinflation and air trapping in the affected lobe, compression of surrounding lung tissue, and displacement of the mediastinum by herniation of the emphysematous lobe across the anterior mediastinum into the opposite chest. There have been 205 cases reported in the literature, although the incidence is undoubtedly much higher.1'4 This article will review the clinical presentation, course, and treatment of lobar emphysema and speculate on its possible causes. The clinical features of congenital lobar emphysema were first described in 1932 by Nelson.5 Royes6 was the first to report a case of lobar emphysema, which he thought was due to partial occlusion of the bronchial lumen by a flap of mucous membrane. A year later, in 1939, Overstreet7 described the pathologic features and called attention to the possible association of a deficiency of cartilage in the lobar bronchus with emphysema of the corresponding lobe. In 1945, Gross and Lewis8 described the successful treatment of lobar emphysema by lobectomy. Robertson and James9 coined the name "congenital lobar emphysema" in 1951. Over the years, 105 cases have been reported in the English and French literature.1"4 Cases in males have been reported twice as frequently as those in females. Several adult patients with this entity have also been described,10 implying that congenital lobar emphysema may not always be a catastrophic neonatal event. Most cases of congenital lobar emphysema are observed in infants with respiratory difficulty. Characteristically, the infant is usually normal at birth and may remain relatively asymptomatic for the first week of life. The respiratory distress is frequently intermittent and is often precipitated by excitement, feeding, or crying. A variety of symptoms may be present, including cough, wheezing, tachypnea, dyspnea, and intermittent cyanosis. Rapid deterioration may occur; at such times, the infant does not significantly improve with oxygen, antibiotics, or tracheobronchial aspiration. The course of lobar emphysema is usually progressive; however, the late progression and the severity of symptoms from lobar emphysema can vary greatly from almost unnoticeable to quite severe. On careful physical examination, the thoracic wall over the involved side is usually more prominent and respiratory excursion is limited. There is hyperresonance to percussion over the affected lobe. Breath sounds are paradoxically decreased over the radiologically hyperaerated lobe, and this can be a clue to diagnosis. The apical heartbeat is shifted away from the affected side, and the diaphragm is depressed on the side with the emphysematous lobe. Signs of consolidation may be elicited on the same or contralateral side, owing to compression of normal adjacent lung by the overexpanded lobe. 1. Murray, G. Congenital lobar emphysema. Surg. Gynecol. Obstet. 124 (1967). 611. 2. Lincoln. J. C. R., et al. Congenital lobar emphysema. Ann. Surg. 773 (1971), 55. 3. Raynor, A. C1 Capp, P., and Sealy, W. C. Lobar emphysema of infancy. Ann. Thorac. Surg. 4 (1967), 375. 4. Hendren, W. H., and McKee, D. M. Lobar emphysema of infancy. J. Pediatr. Surg. 1 (1966), 24. 5. Nelson. R. L. Congenital cystic disease of the lung. J. Pediatr. 1 (1932). 233. 6. Royes. K. Localized hypertrophic emphysema. Br. Med. J. 2 (1938), 659. 7. Overstreet. R. M . Emphysema of a portion of the lung in the early months of Me. Am. J. Ois. Child. 57 (1939), 861 . 8. Gross, R. E.. and Lewis, J. E. Defect of the anterior mediastinum. Surg. Gynecol. Obstet. 80 (1945), 549. Figure 1. 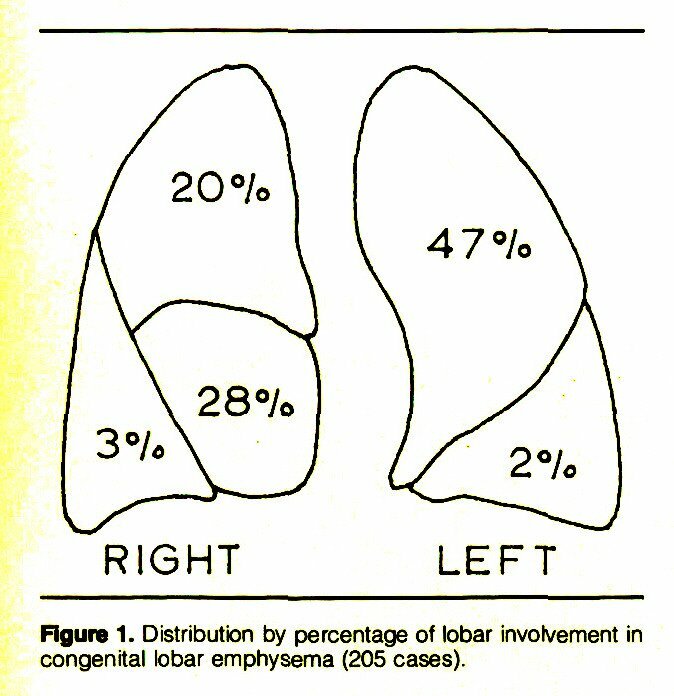 Distribution by percentage of lobar involvement in congenital lobar emphysema (205 cases). The relative frequency of involvement of the five pulmonary lobes in the 205 reported cases is shown in Figure 1. The left upper lobe is by far the most often affected, followed by the right middle and upper lobes. Congenital lobar emphysema of the lower lobe is quite rare. On occasion, multiple-lobe involvement may occur. There is an increased incidence of coexistent abnormalities of other systems, congenital heart disease being the most frequent. Murray1 cited a 14 per cent incidence of associated heart disease in his review of 166 cases of lobar emphysema, and Lincoln and colleagues2 found an even higher frequency (37 per cent) in their series. Stranger and coworkers11 emphasized that cardiac anomalies associated with distended pulmonary arteries or a large atrium often cause external compression of the lobar bronchi. This is particularly true for the left main bronchus, the left upper lobe, and the right middle bronchus. The most frequent such cardiac anomalies are ventricular septal defect, patent ductus arteriosus, and tetralogy of Fallot. Pulmonary hypertension with dilated pulmonary arteries is present in most of these cases. A variation of this is large areas of hyperinflation, not fully lobar in size or distribution, which are associated with left-to-right congenital heart lesions. These areas are often transient and migratory and resolve when corrective surgery of the underlying cardiac lesion is performed. The most useful diagnostic test is a plain x-ray of the chest in posteroanterior and lateral views. From such a film, the lobar hyperinflation can easily be seen (Figures 2 and 3). Broncho vascular markings are present in the radiolucent lung - in contrast to a pneumothorax, with which lobar emphysema may be confused. In most cases, there is mediastinal shift with herniation of the affected lobe across the mediastinum. On lateral view, a translucent anterior mediastinum is suggestive of lung herniation. There is usually compression of adjacent lung tissue by the affected lobe. By fluoroscopic examination, the mediastinal shift is fixed, and there is little diaphragmatic movement on the affected side. Bronchoscopy and bronchography are rarely indicated. If there is a suspicion of coexistent congenital heart disease, cardiac catheterization may be useful. Figure 2. 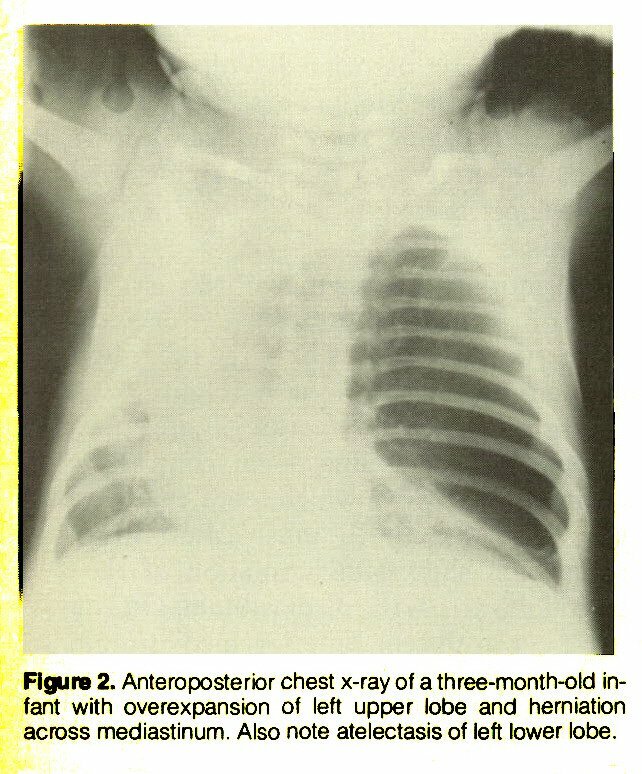 Anteroposterior chest x-ray of a three-month-old infant with overexpansbn of left upper lobe and herniation across mediastinum. Also note atelectasis of left lower lobe. Figure 3. Lateral chest x-ray of same patient, showing anterior hyperlucency of overdistended and herniated upper lobe. The differential diagnosis includes several conditions causing respiratory distress during infancy. Pneumothorax, pneumatocele, and congenital lung cysts all have an absence of pulmonary markings in the radiolucent areas. 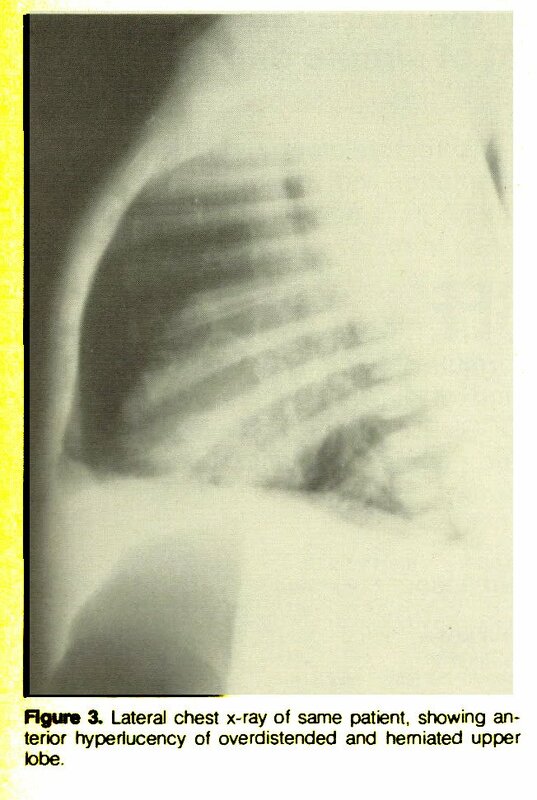 The radiographic picture of diaphragmatic hernia should not be confused with that of congenital lobar emphysema. Following an acute episode of pneumonia, especially adenoviral - with resultant bronchial damage, obliterative bronchiolitis, and regional obstructive emphysema - a quite similar roentgenologic picture may be present. This entity is known by several names, including "unilateral hyperlucent lung." The history is often helpful in differentiating the two entities. In older children, foreign-body aspiration with regional emphysema may mimic lobar emphysema. A particularly difficult problem in the differential diagnosis is primary atelectasis with compensatory overinflation of the good side. The apparent lack of uniformity in the pathologic anatomy found in the resected specimens has aroused considerable academic interest. Grossly, the affected lobe is massively and uniformly distended (Figure 4). The emphysematous lobe cannot deflate and appears to have a permanently impaired ability to do so, possibly being prevented by the immaturity and distortion of the pores of Kohn. * Microscopically, the lung parenchyma shows an increase beyond the normal in the size of the air spaces distal to the terminal bronchioles. It is difficult to tell whether this is from dilation or destruction of the alveolar walls. There are varying reports of deficient cartilage development in the bronchial mucosa of the emphysematous lobe. This, in addition to other associated anomalies, has led to a variety of theories on the etiology of congenital lobar emphysema. Theoretically, congenital lobar emphysema must be caused by a primary alveolar lesion, bronchial obstruction, or both. Bolande and colleagues12 investigated the alveoli as the site of the abnormality and found that in most areas, supporting stroma of the alveolar walls appeared to be thickened. It may well be that increased alveolar rigidity hinders the collapse of the parenchyma during expiration. Murray1 reported that 50 per cent of the 166 cases of lobar emphysema he reviewed were associated with bronchial obstruction. Well over half of this percentage had a congenital deficiency of bronchial cartilages. Other types of intrinsic bronchial obstruction included bronchial stenosis and redundant mucosal folds. Extrinsic pressure causing bronchial obstruction was usually due to vascular compression, most often from the pulmonary artery. The common denominator in these obstructions hinders expiration by bronchial narrowing compounded by functional expiratory bronchial collapse. This ball valve arrangement leads to the hugely overdistended noncollapsible lobe. Oddly enough, recurrent collapse of the involved lobe has not been reported. Moreover, clinical evidence of bronchiectasis, the result of obstruction and infection, has not been reported in lungs affected by lobar emphysema. In a review of 113 cases, Raynor and coworkers3 reported 55 per cent to be of undetermined origin. The finding of normal pathology in the resected specimen does not negate the diagnosis of congenital lobar emphysema, as it is perhaps a symptom complex rather than a specific disease entity. Recent studies by Eigen et al.13 and by Shannon14 indicate that lobar emphysema may be a manifestation of generalized lung disease resulting from the loss of static recoil pressure of the lung. This causes airway collapse at abnormally high volume. The generalized lung disease, with its changes in dynamic collapse, is of unknown origin. The dynamic collapse is greatly accentuated with crying, and the indications are that the lobar hyperinflation usually resolves spontaneously. Lobectomy is the current method of treatment in most cases of congenital lobar emphysema.4,15"17 For many years it was believed that nonsurgical therapy was contraindicated on the grounds that surgery would improve pulmonary function by releasing compressed normal lung parenchyma. It was also believed that surgery would obviate sudden massive distention or unexpected rupture of the affected lobe. In addition, it was believed that resection would prevent recurrent pulmonary infection and allow for growth of new lung tissue by alveolar budding. However, in the study by DeMuth und Sloan,18 with five- to 14-year follow-up of lobectomy patients, there was no evidence of regenerating lung tissue. 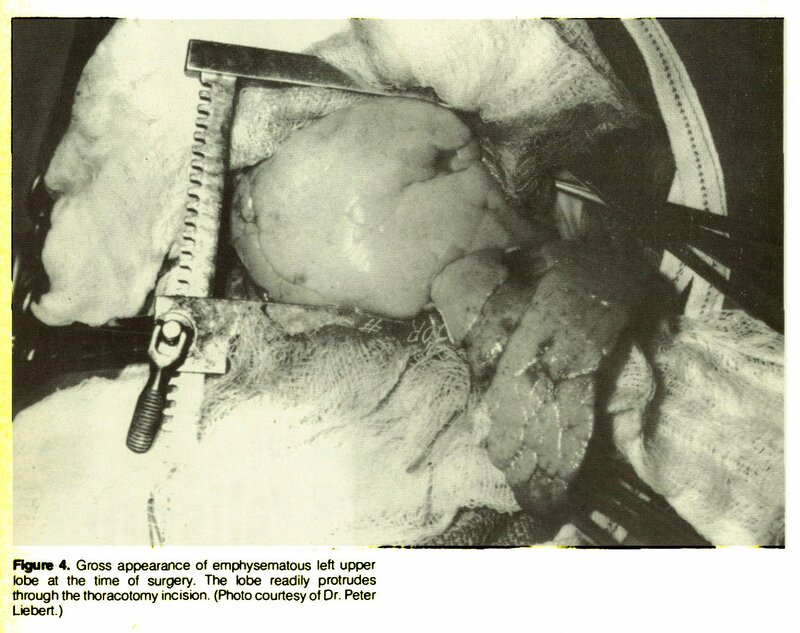 In 1976, Eigen et al.13 reported a study involving the long-term follow-up of surgically and nonsurgically treated cases of congenital lobar emphysema. Both groups had normal growth and were free of pulmonary symptoms. Pulmonary function studies did not differ significantly between groups. In the lobectomy patients, the vital capacity and total lung capacity were decreased in proportion to the amount of lung tissue resected. In the conservatively treated nonsurgical group, follow-up roentgenograms suggested that the distended lobe had not continued to enlarge in proportion to the remaining lung; thus, it appeared to have come to represent a smaller percentage of the total lung capacity. Growth of the remaining lung tissue was not appreciably influenced by the presence or absence of the diseased lobe. The decision to perform lobectomy generally depends on the severity of respiratory distress of the infant with congenital lobar emphysema. Undoubtedly, the severity of distress is proportional to the amount of functioning lung tissue present.19 Consideration of conservative treatment is indicated for the eupneic or mildly affected patient. Infants in significant respiratory distress need immediate excision of the diseased lobe to allow for expansion of compressed functional tissue. Congenital lobar emphysema is frequently a life-threatening disorder presenting in infancy. The diagnosis should be considered when the patient shows signs of respiratory distress and the x-ray demonstrates the characteristic hyperlucent lobe with compression of the surrounding lung tissue. The morphologic aspects and pathogenesis are not clearly defined, although it is thought that an abnormality of bronchial cartilage is probably associated with the development of lobar emphysema. The results of treatment by lobectomy are excellent, and the mortality with surgery is low. Consideration of nonsurgical management is worthwhile in mildly affected or asymptomatic patients. Long-term follow-up of both groups indicates a very favorable prognosis in this disease entity. 9. Robertson, R., and James E. S. Congenital lobar emphysema. Pediatrics 8 (1951). 795. 10. Shaw, R. B. Localized hypertrophic emphysema. Pediatrics 9 (1952), 220. 11. Stranger, P., Lucas. R. V., and Edwards. J. E. Anatomical factors causing respiratory distress in acyanotic congenital cardiac disease: Special reference to bronchial obstruction. Pediatrics 43 (1969). 760. 12. Bolande, R. B.. Scheider, A. F.. and Boggs, JO. Infantile lobar emphysema. Arch. Pathol. 61 (1956), 289. 13. Eigen. H.. Lernen, R. J., and Waring, W. W. Congenital tobar emphysema: Long-term evaluation of surgically and conservatively treated children. Am. Rev. Respir. Dis. 113 (1976), 823. 14. Shannon, D. G. The natural history o1 lobar "emphysema." Am. Rev. Respir. Dis. 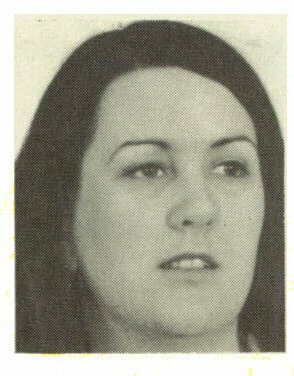 113 (1976). 42 (abstr). 15. Sloan, H. Lobar obstructive emphysema in infancy treated by lobectomy. J. Thorac. Cardiovasc. Surg. 26 (1953), 1. 17. Kennedy, J. H., and Rothman, B. The surgical treatment of congenital lobar emphysema. Surg. Gynecol. Obstet. 121 (1965), 253. 18. DeMuth, G. R., and Sloan, H. Congenital lobar emphysema: Long-term effects and sequelae in treated cases. Surgery 59 (1966). 601. 19. Leape, L. L., and Longino, L. A. Infantile lobar emphysema. Pediatr. 34 (1964), 246.